I'm like a Rock 'Em Sock 'Em Robot of bad metaphors. A refractometer is one of the most useful tools a brewer can have. It allows for near-instantaneous measurements of specific gravity, without having to compensate for or adjust sample temperature or withdraw a large volume of wort/beer (a significant concern at homebrew scales). There are a few issues associated with accurately using a refractometer for brewing, though. First, a refractometer does not actually measure specific gravity, or sugar content. Instead it simply projects a line through a reticle, and relies on the fact that the refractive index of the fluid will move a line up and down the reticle. For a simple sucrose solution (the refractometers common to homebrewers are “borrowed” from the wine industry) the refractive index depends only on the sugar content and the temperature. Automatic temperature correcting (ATC) refractometers use a bimetal strip to cancel out the temperature variable (within a given range), meaning that the reticle can be marked directly in units of sugar content. Brewers’ wort, however, is not a sucrose solution, and so a “wort correction factor” must be applied. Generally this is done by dividing the refractometer reading by 1.04. Where RIi and RIf are the initial and final refractive indices, respectively, in wort-corrected degrees Brix. I took pre- and post-fermentation readings of ten beers, with OGs ranging from 1.036 to 1.103, using both a refractometer and hydrometer. 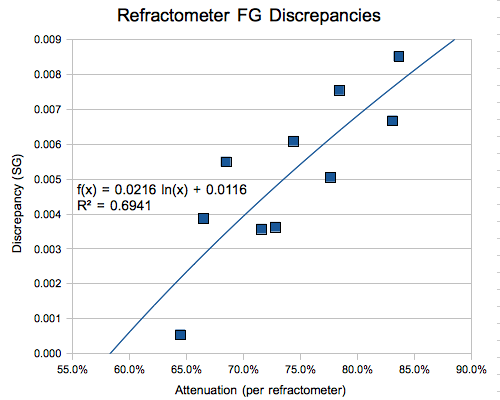 In every case the refractometer correlation provided an FG that was lower than the hydrometer reading, by anywhere from 0.5 to 8.5 “gravity points” (1000*(SG-1)). The mean discrepancy is 5.1 points. The main variable of concern seems to be the attenuation of the beer; the greater the attenuation, the larger the discrepancy. The results are plotted below. In order to spare anyone who might be interested some trouble, I’ve put together a simple spreadsheet that will calculate FG using both the old and new correlations, in addition to attenuation and ABV. If you end up using it for a significant number of batches, please share your results. I’ve since refined the FG correlation, using a more mathematically rigorous method. I leave the original post up for transparency’s sake, but if you’re looking for an FG calculator, please check out the new post. I’m trying to square this with Papazian’s zen mantra “relax, don’t worry, have a homebrew”, but my brain keeps shorting out. Yeah, there’s definitely no way to square this kind of thing with the RDWHAHB mindset. What can I say? I’m a scientist; if my instruments aren’t calibrated, I’m not happy. ‘a bit unwieldy’ ??? LOL! I’m surprised Excel allowed a formula that long! But is there a prob with the ABV part? I was just messing around with it and changing number in the brix section, the ABV always seems to be 5.0% or 4.9% I tried brix # of Original always 13 and final of 1,3,5,7,9,11, and 13. But I’m more interested in the brix to SG number anyways. Thanks for the catch, Dave. I forgot to convert the FG to °Plato in the ABV formula. I’ve uploaded a new version that should work correctly. The original formula is also borrowed from wine-making; when making wine I find the formula to be spot on generally. That makes sense, since in any wine must very nearly 100% of the sugars would be fermentable. Thanks. Thanks for a deep analysis Sean, I’m surprised the simple linear forumula gives such good results! I created a simpler spreadsheet to use for my daily brewing needs that doesn’t have the “extra” columns and using your new linear formula. Since my refractometer does auto-temperature correction and has a SG and brix scale, I read mine off in SG. This spreadsheet simplifies that a little for a single beer read multiple times. It’s based from one from morebeer.com that I liked, but heavily modified using the improved formulas, etc. I thought I’d post it here in case others find it useful. Thanks Brett. The spreadsheet looks nice, although it doesn’t seem to work in OpenOffice. Bear in mind, though, that unless there’s a new one on the market, those SG refractometers were manufactured incorrectly. They used an approximation, SG = 1 + 0.004*Bx, rather than converting correctly. The approximation is only within one gravity point for SGs below ~1.055. I noticed that you read Cryptonomicon recently. That’s probably my favorite book. Sorry about the Microsoft specific format, and thanks for the reply, I had not heard of this defect. Mine was bought a few months ago and I recall the manufacturing date being a maybe a year or two old. I suppose I should read off the Brix scale instead? You seem to understand a lot about refractometer precision..! I guess this gives me a couple more changes to make to my spreadsheet..
It’s easy to check if your SG scale is accurate; just look at the line for 20°Bx. It should correspond to about 1.084 SG. If it’s ~1.080 instead, then the manufacturer didn’t apply the correct conversion. Wow, Sure enough it’s a bad conversion. Looking across from 20Bx I see 1.078 or so. Thanks for the tip! To be honest, I’m not sure. I’d like to think there was a reason, but it’s been almost two years and I just don’t remember. For what it’s worth, I did a curvefit using the actual attenuation and it was almost identical. As I recently purchased a MoreBeer refrac, I was researching how to use them during and after fermentation. I immediately downloaded a widely available spreadsheet, noticed the old cubic regression, and began to wonder who developed the relationship and how many measurements were used to develop it. Some use of the google machine then landed me here. I just read your three (I think) posts on the subject and you walked through the exact thought process I would have taken to answer my own questions. Thanks so much for the thorough documentation and for providing this spreadhsheet and php tool. I now have a better understanding of how this process works and of the accuracy and precision I can expect from this new toy. Thanks! Sean: an impressive analysis. However, I think your critique of the original regression to estimate FG from initial and final RI measurements is misplaced. I believe you have misinterpreted (and therefore misapplied) Bonham’s original equation [Bonham, L. K., "The Use of Handheld Refractometers by Homebrewers," Zymurgy, 43-45, January/February (2001)]. What you call RIi, Bonham called OG in degrees Plato. Since your RIi is a “wort-corrected” degrees Brix, there’s no real problem, there. However, you are using this same “wort correction” for your RIf, and Bonham is not. Bonham’s equation uses the raw reading of final RI (i.e., without any correction). Thus, you are using a lower number for RIf than Bonham intended, which probably explains why you estimated a lower FG with his method than actually measured with a hydrometer. Frankly, it makes no sense to correct the final Brix measurement — at least not with the same correction factor as used for initial wort. The correction factor (often assumed for initial extract to be 1.04 — i.e., Initial extract = Initial Brix/1.04) is, among other things, to correct for the presence of non-extract constituents in the wort that give a positive RI measure. After fermentation, the fraction these constituents would contribute to final RI would be expected to be much higher than in the initial wort. There is no basis for using the same correction factor for both initial wort and final beer, which is probably why Bonham’s empirical regression did not call for a correction at all. There’s nothing wrong with devising an empirical regression formula to predict FG using any transformation of variables you wish. Heck, you could use Rif + 10 if you wanted, or Rif squared. My point is not that your method is “wrong,” but merely to point out that your critique of Bonham’s is a bit misplaced, since I believe you have misapplied his equation.